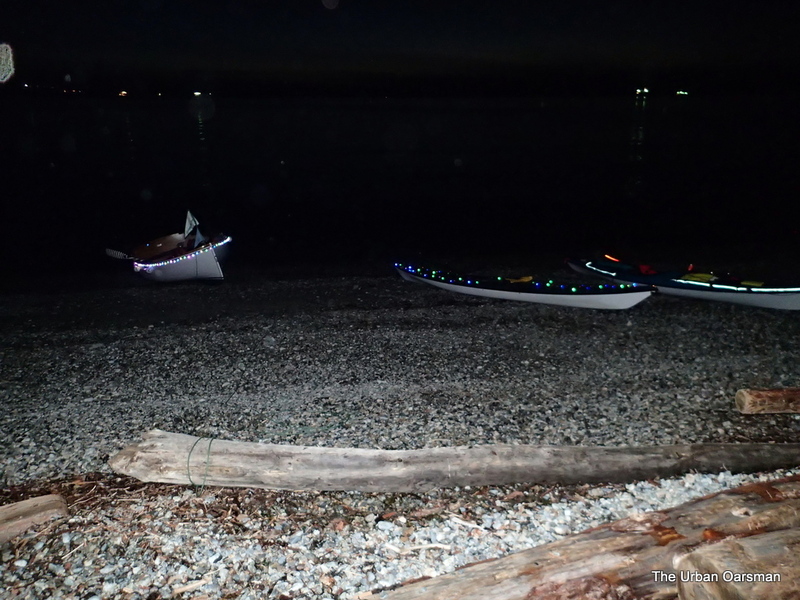 Every year the Hollyburn Sailing Club has an evening row to the Dundarave Festival of Lights where the Forest of Miracles Christmas Trees are and the Bonfire. The Sailing Club sponsors a tree, decorating it in the Club’s colours. This year the tree had a blue/white light colour scheme…I am lobbying for a red (Port) green (Starboard) colour scheme for next year. 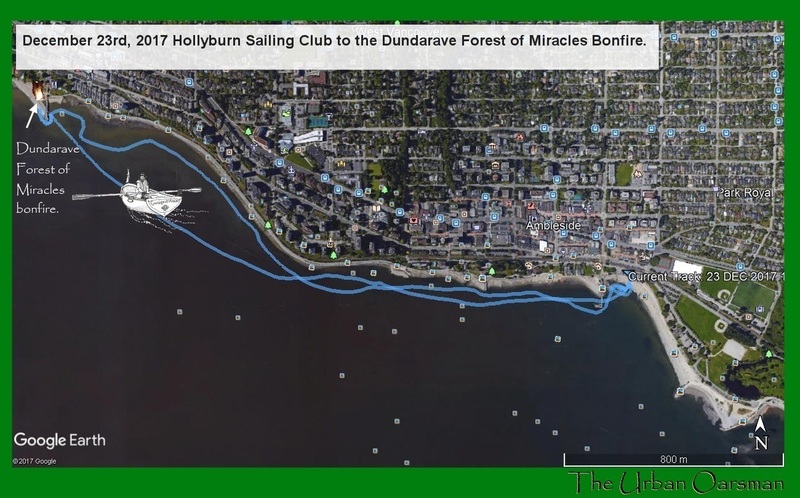 Forest of Miracles Hollyburn Sailing Club tree, 2017. 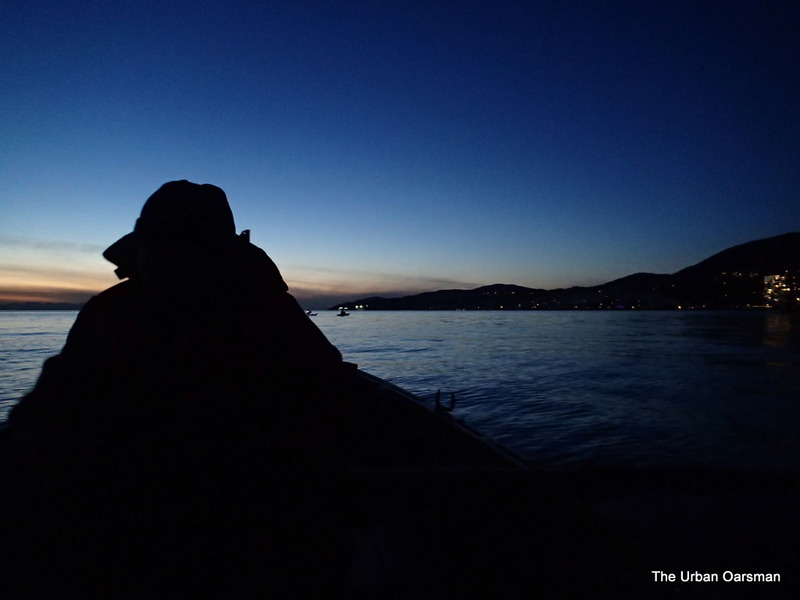 The row usually takes about two hours, leaving the club after dusk (4:30pm.ish) and returning by 7pm. 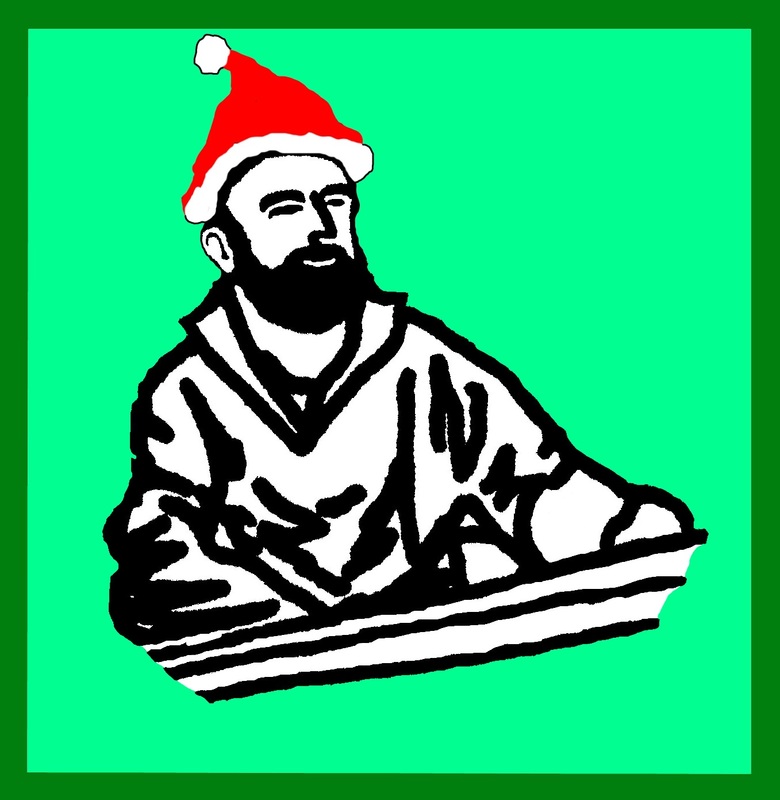 The trip is followed by a pot-luck supper and a visit to the club by Santa Claus for the more junior members. I arrive early and have to dust off the snow from Gwragedd Annwn’s cover. 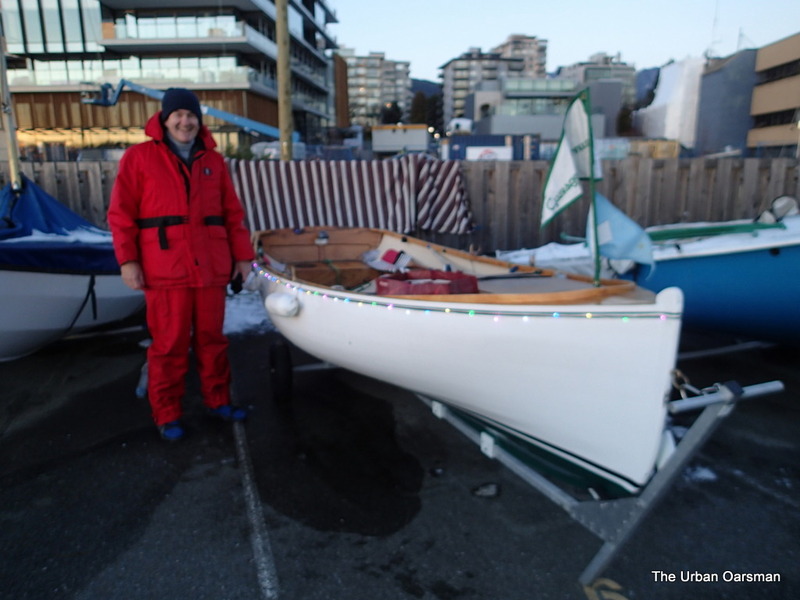 Readying Gwragedd Annwn for the 2017 Hollyburn Sailing Club Christmas Paddle to Dundarave Forest of Miracles and bonfire. The snow is frozen into sheets and come off in big pieces. Our fellow member, Don, will be coming with me on this trip. Don and Gwragedd Annwn with her Christmas lights on. 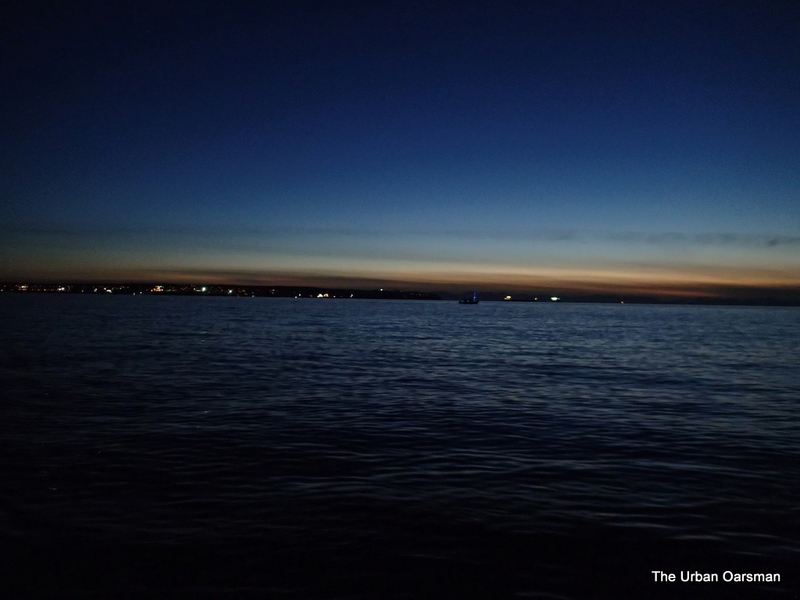 It is a beautiful sunset…. 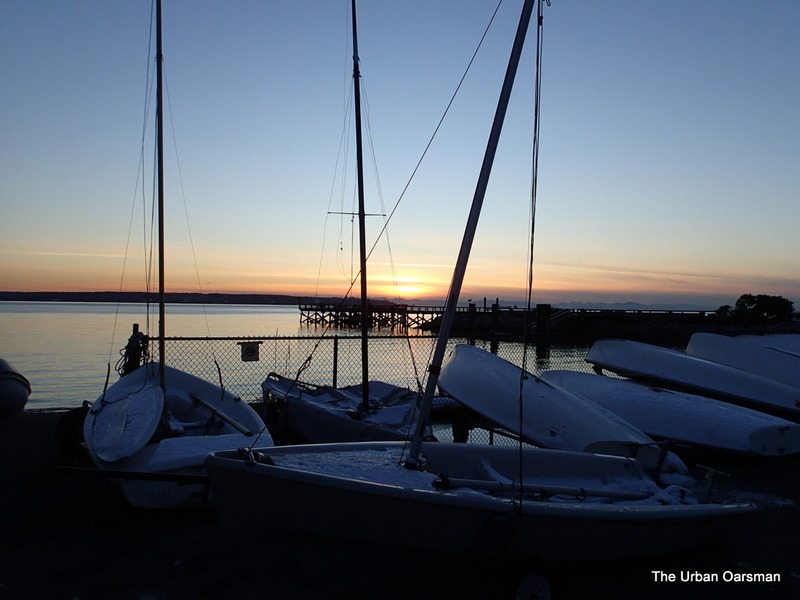 Sunset at Hollyburn Sailing Club. We launch Gwragedd Annwn. There will be two Kayaks, the Safety boat and Gwragedd Annwn on this trip. HSC Safety boat for the evening. Don and Rueben will crew the safety boat. 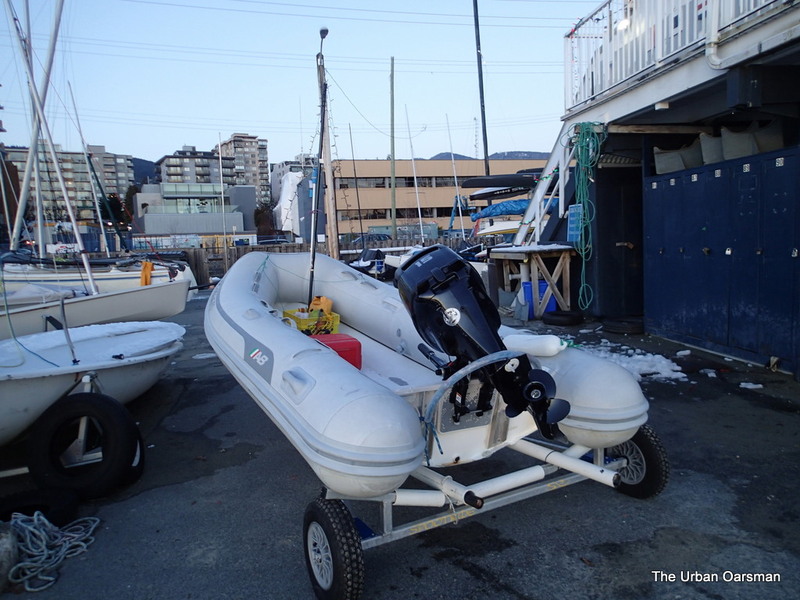 Whenever the Club sponsors a function, they provide a safety boat…just in case. We all take a turn over the year’s events. 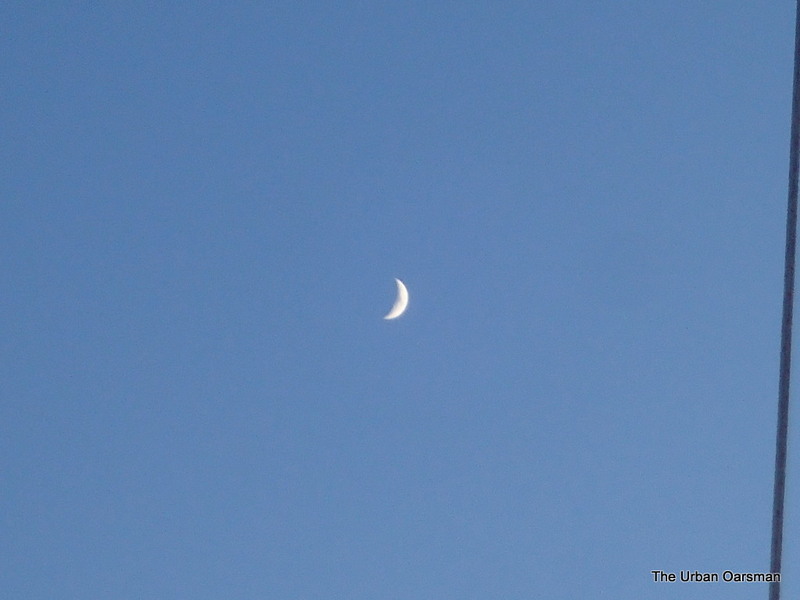 The moon leads the way. The Safety boat is next. Up in the Club, preparations are underway for the post-paddle pot luck and Christmas party. Roy has his white light at his back. Don rowing with the Kayakers in the lead. This is the first time that Don has been in Gwragedd Annwn. He feels that she rows well. 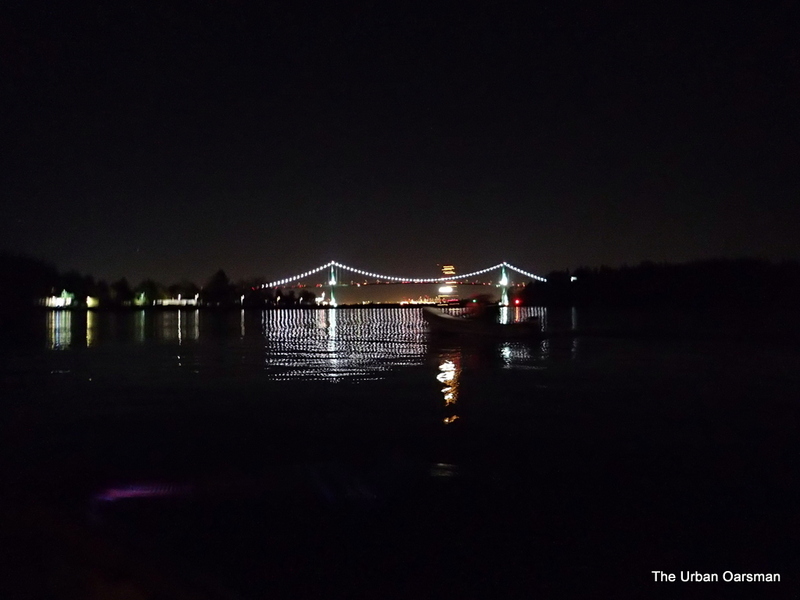 The Oarsman’s view, Lions Gate Bridge to the East. 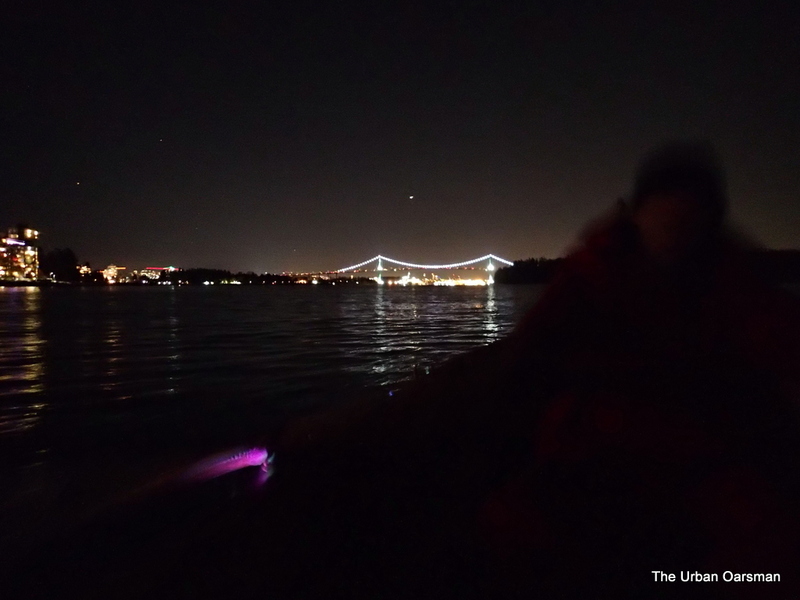 The safety boat follows along, outside of the paddlers. 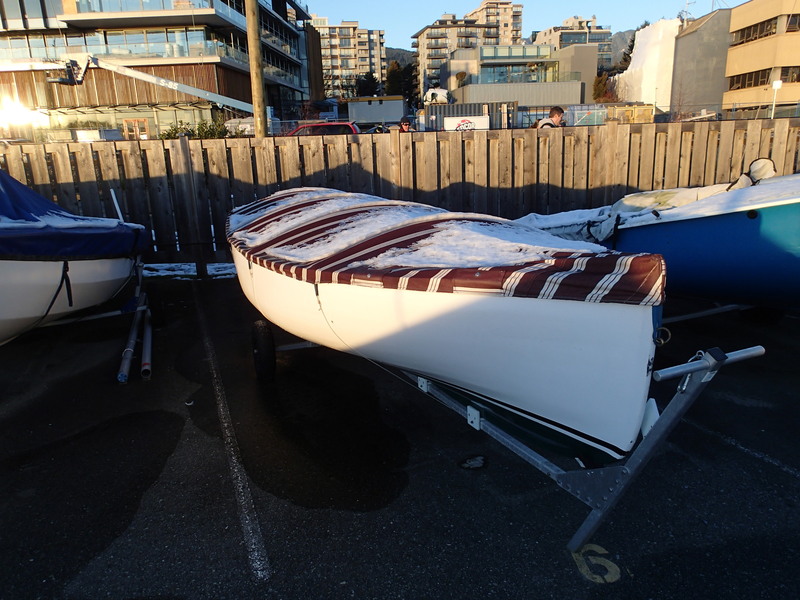 The Hollyburn Sailing Club safety boat. 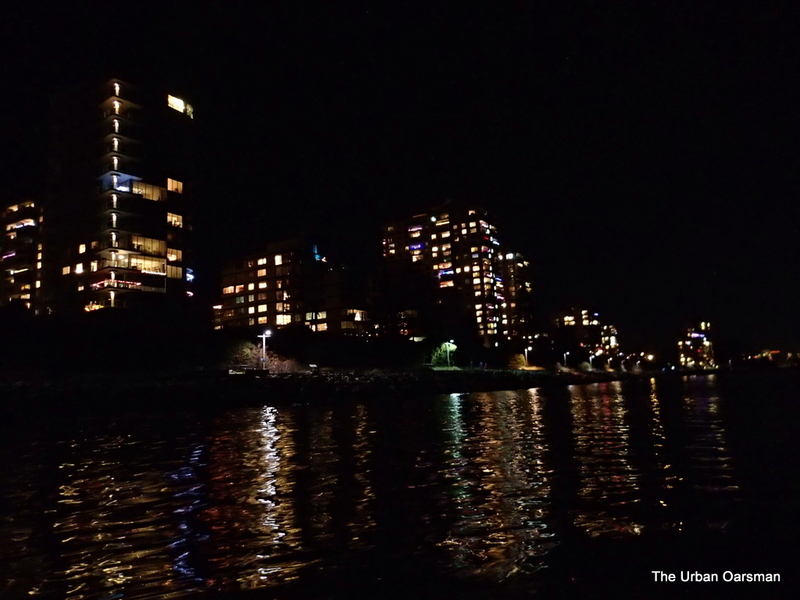 The West Vancouver Shoreline is brightly lit. 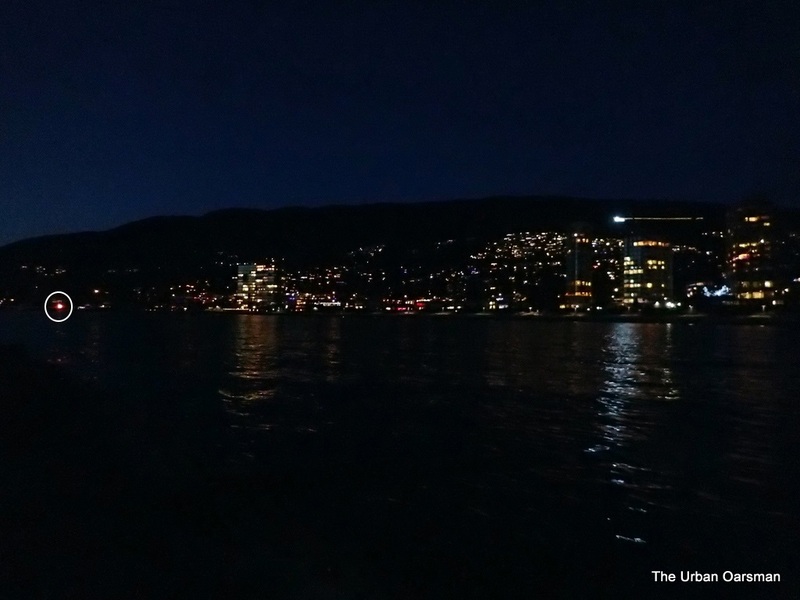 The West Vancouver Shoreline shimmers in the clear, crisp & cold air. We (the Kayaks, Safety Boat and Gwragedd Annwn) are the only boats on the water. 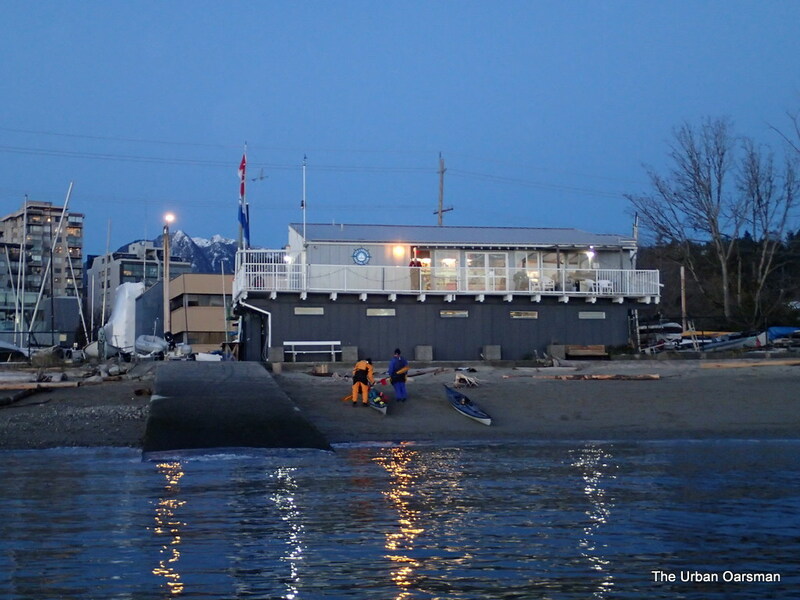 To keep Don’s feet dry, I drop him off at the Dundarave Pier dock and row around the pier to the beach. 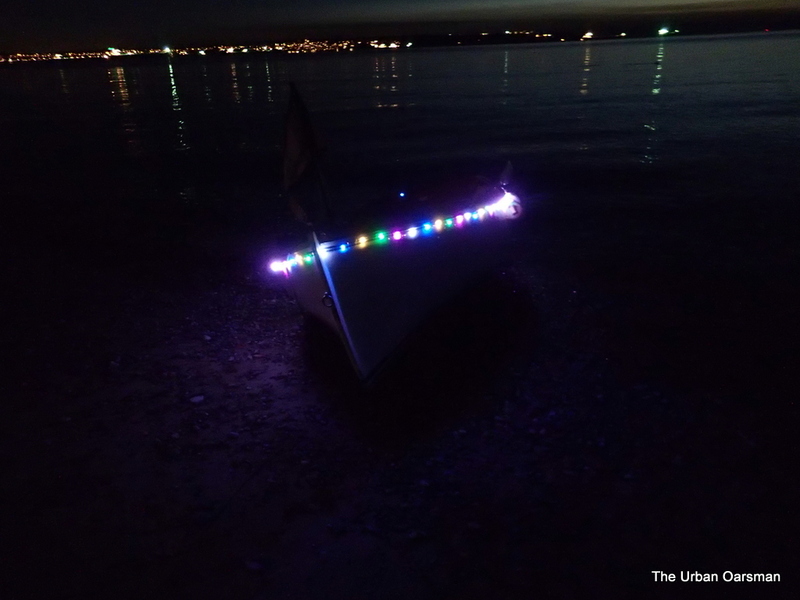 Gwragedd Annwn with her Christmas lights on the beach at Dundarave. 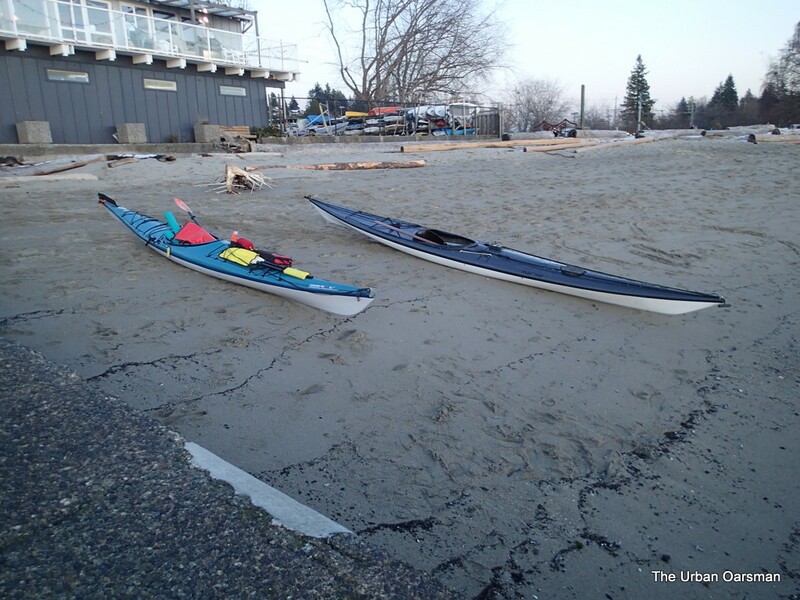 The Kayaks have landed as well. Rowers (and Paddlers) on the beach. 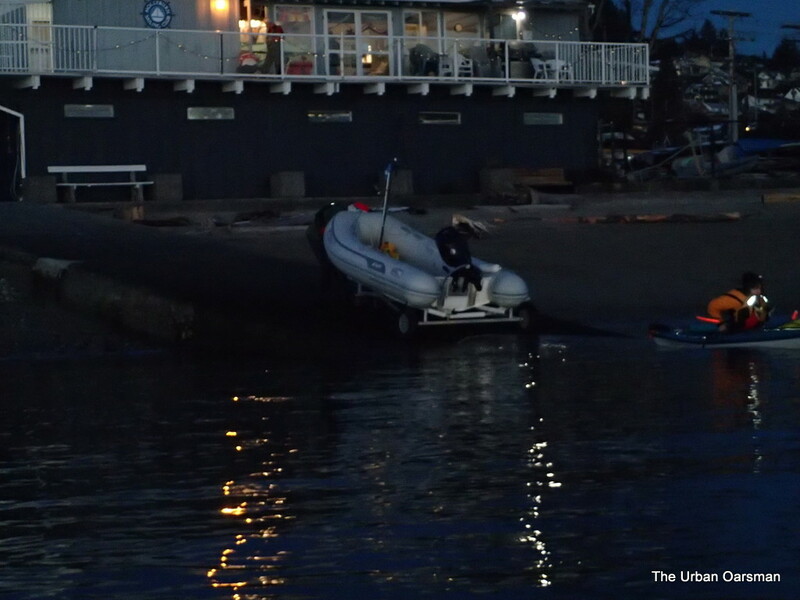 The Hollyburn Sailing Club Safety boat is tied to the Dundarave Pier float. 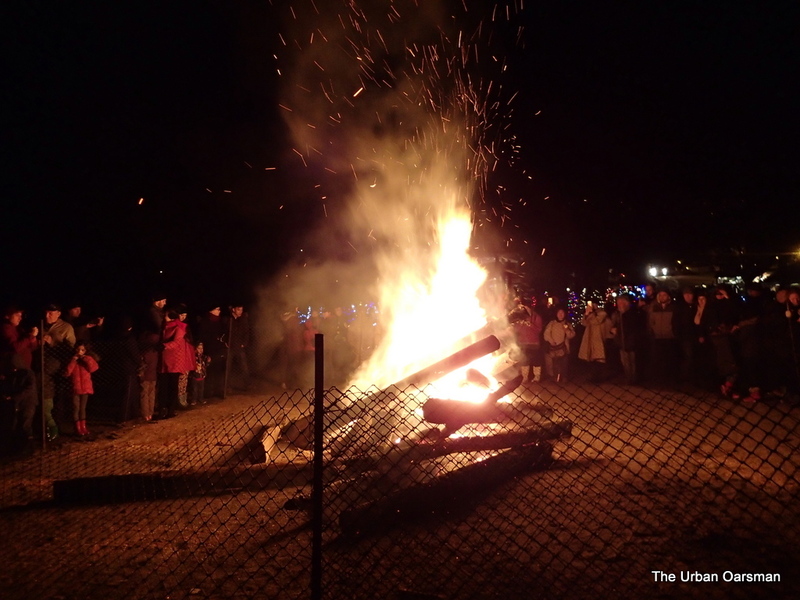 The bonfire is big, bright and surprisingly warm. 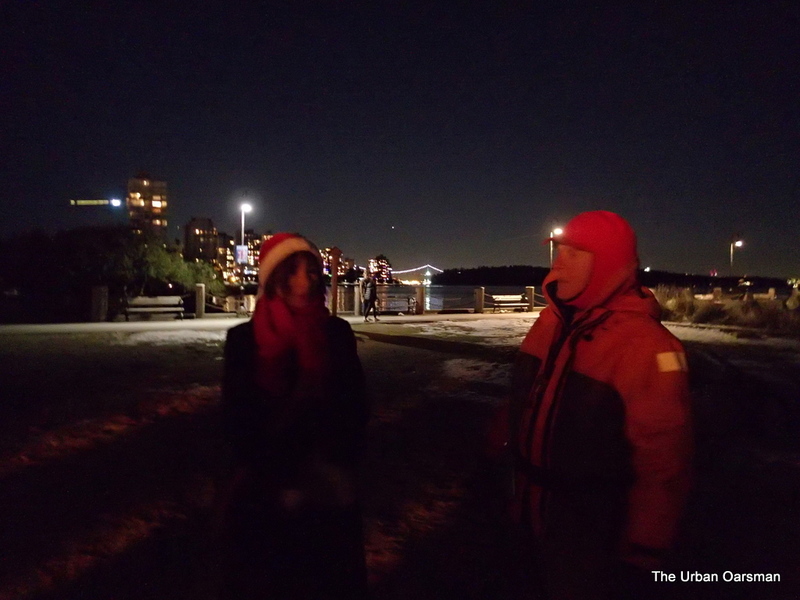 Dundarave Festival of Lights 2017 bonfire. We all go to the main tent and get hot chocolate and cookies (by donation). 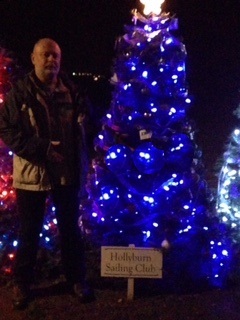 We take a group photo by the Hollyburn Sailing Club tree. Getting a little cold, we decide to get the blood pumping by going back to the Club. 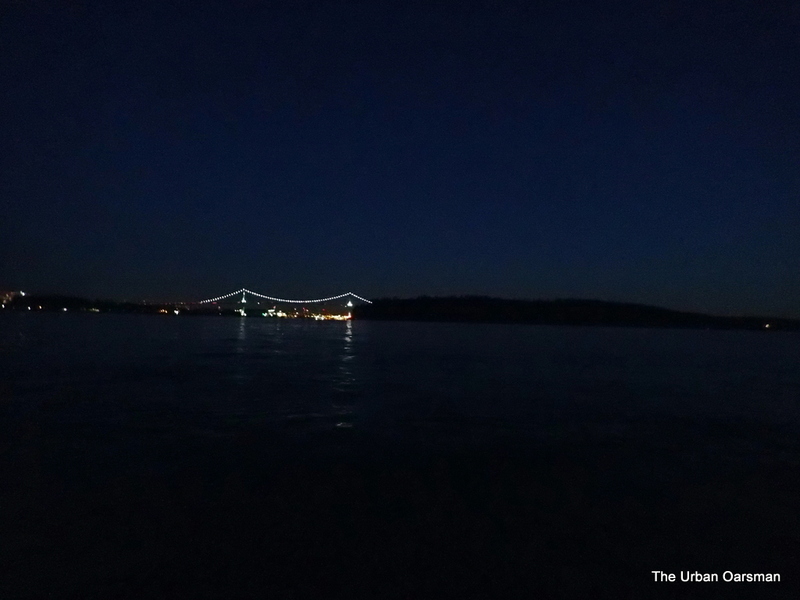 On the way back to HSC, we stay closer to shore to avoid the North-East drift. The air is a little stiller closer in. 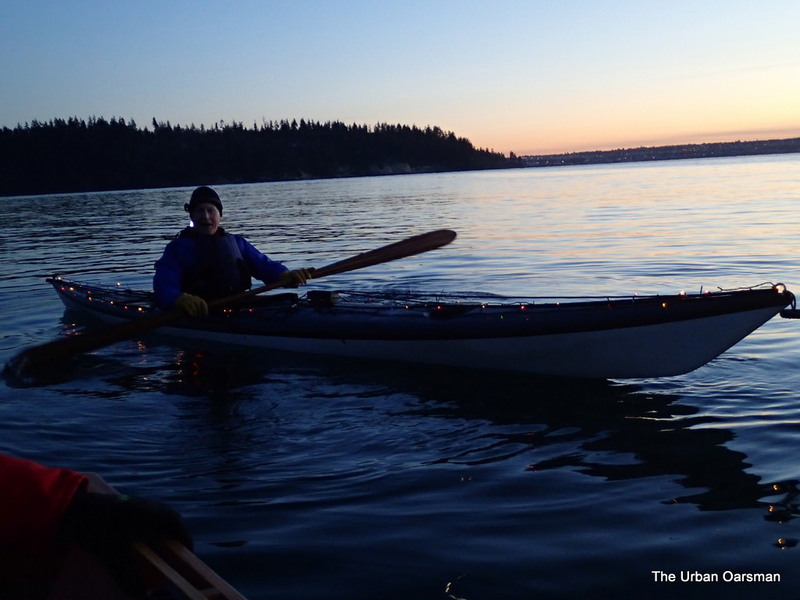 Don takes the oars and we are heading back. 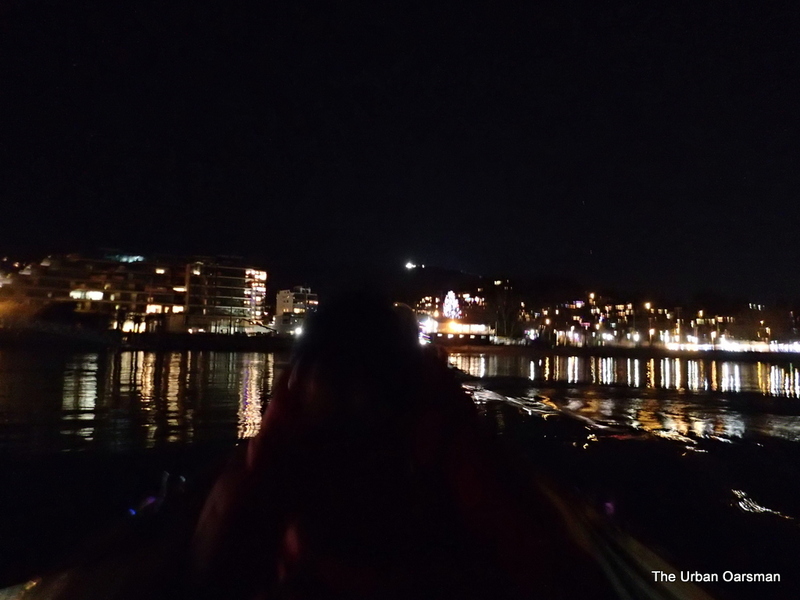 Gwragedd Annwn’s Christmas lights reflect off of the oars. 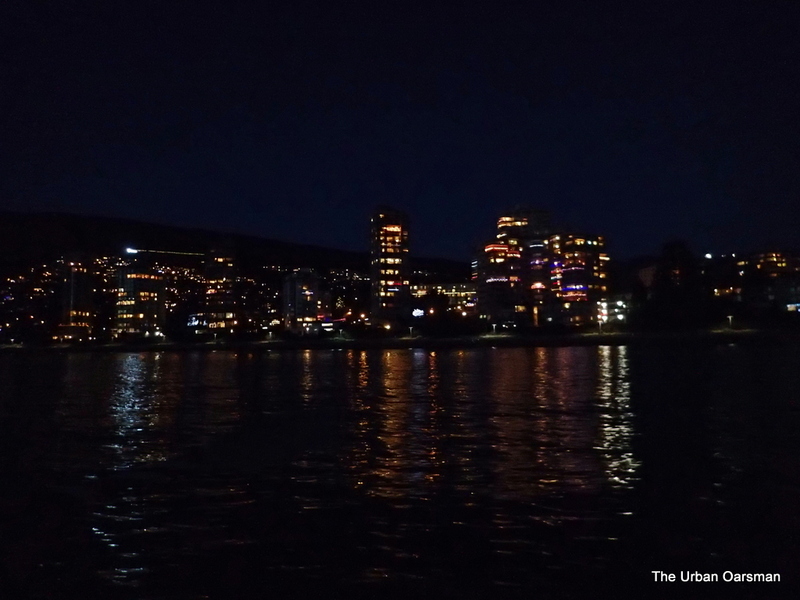 There is also a “glow” in the water around Gwragedd Annwn. 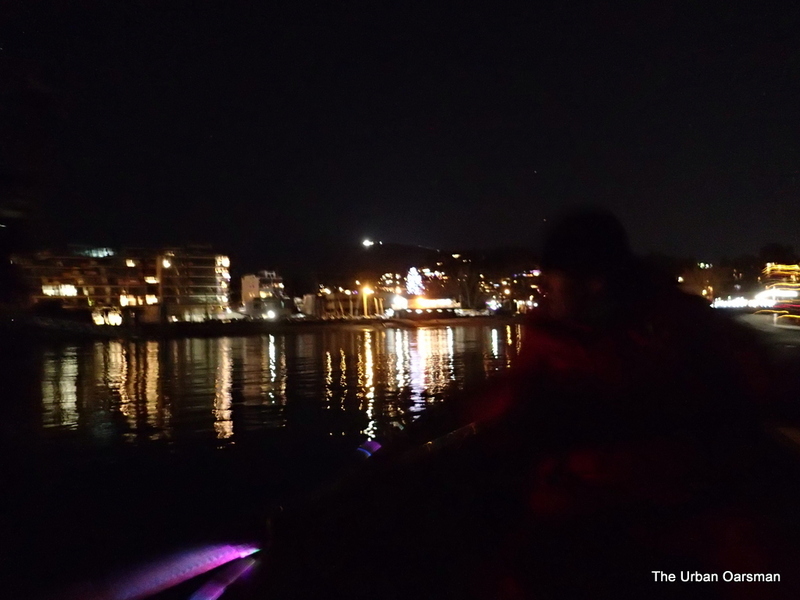 Almost at the Club, just off of the 14th Street Pier, the Safety Boat heads in. 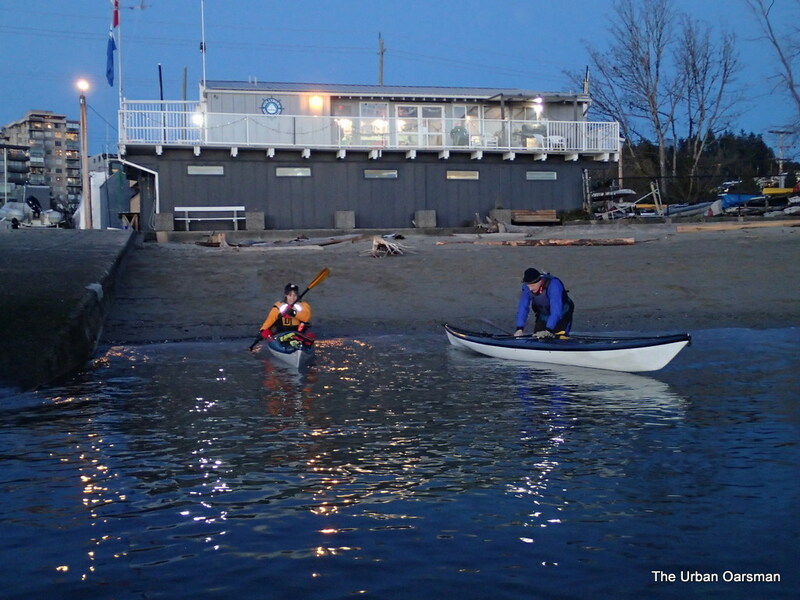 AS usual when rowing with Kayaks, the little white rowboat always comes last. 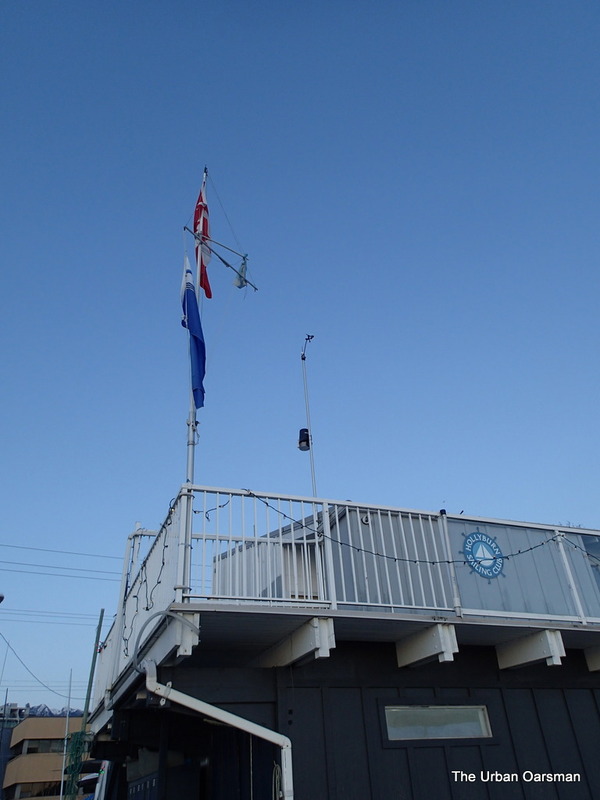 The Hollyburn Sailing Club Clubhouse. Back at the club where the warmth awaits. I take the oars and drop Don off at the 14th Street Pier floating dock. A little later, The Safety Boat, the Kayaks and Gwragedd Annwn are put away and we all go upstairs in the Club for a Christmas pot-luck.